Cyclist Stephanie McKenzie has been named to join the Commonwealth Games track team after an outstanding trial last week at the Avantidrome..
McKenzie, 21, joins the track cycling team while Wellington's Li Feng Yang, 24, doubles the presence of the diving team by joining Liam Stone. Former Aucklander McKenzie moved to Southland to further her cycling career and is now based at BikeNZ's High Performance Centre in Cambridge. She earned her nomination after an outstanding trial last week at the Avantidrome, clocking 34.91 seconds for the 500m time trial, which was under the national record. McKenzie won four national titles at the New Zealand championships in Cambridge two months ago but was asked for further improvement to fall inside the selection criteria of top six in the Commonwealth to make the team for Glasgow. Her time trial performance would have placed her within that criteria based on times at this year's world championships. 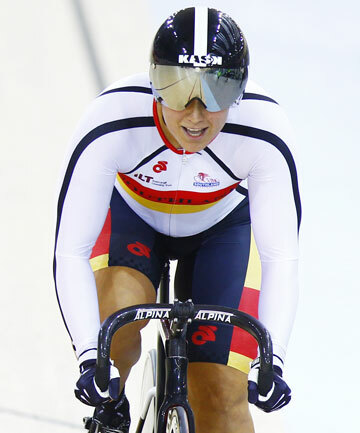 McKenzie, who is a type 1 diabetic, won four medals at the junior world track championships in 2010 and 2011. She is a former competitive gymnast who switched to cycling eight years ago. Feng Yang joins 17-year-old Stone in the 1m and 3m diving events, while he will also contest the 10m platform dive, where he will be aiming for a medal. His inclusion means he and Stone can form a team in the 3m synchronised pairs event - a first for NZ diving at the Games. Injury saw the former Chinese native switch to coaching and in 2010 he became assistant coach at Wellington High Performance Aquatics before returning to competition while maintaining his coaching commitments. "Feng Yang is capable of performing dives to an extremely high standard and was awarded 10 points from some of the international judges at a recent competition in Puerto Rico,'' said Olympic diving judge and Diving New Zealand board member Simon Latimer. ''He is the best platform diver New Zealand has ever had. Feng Yang wants to represent New Zealand at the highest level and is aiming to finish in the top three in the men's platform in Glasgow. He also has his eyes set on the 2016 Rio Olympic Games." Feng Yang was nominated for the Commonwealth Games team after progressing through to the finals at Fina Diving Grand Prix Events in Gatineau (Canada), San Juan (Puerto Rico) and in Guanajuato (Mexico), while also breaking the NZ men's platform record. New Zealand has won four bronze medals in Commonwealth Games diving, the last at Auckland in 1990 by Nicky Cooney in the 3m springboard.